The 2010 Fringe Festival is here! This event, which runs from July 29 - August 7, can be a fun event to take children of any age. There is a ton of colourful activity on the street, with musicians and performers, yummy food and crafts and wares from all over the world. Professional street performers will overtake Broadway Avenue weekday evenings at 6 p.m. and after noon on the weekends. There are free street concerts Thursday, Friday and Saturday at 8 p.m. There are also three kid-friendly ticketed shows this year. Much More Munsch! from Wide Open, which opens July 30, is a 60-minute show especially for young audiences. Six new stories written by Robert Munsch will be performed by 32 Muppet-style puppets. Click here for times and tickets. African Folktales with Erik de Waal, which also opens July 30, is a 45-minute show especially for young audiences. 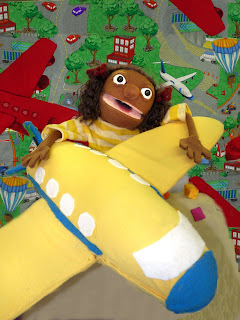 African folktales come to life through storytelling, puppetry and lots of laughs. This has been one of the StarPhoenix's Top 10 shows for the last three years. Click here for times and tickets. All of the ticket proceeds go straight to the hard-working performers. To recoup costs, each theatre patron over the age of 12 is required to also purchase a $5 Fringe Button that is good for throughout the event. Click here for a full theatre listing and online ticket purchasing. Share your thoughts of this year's Fringe Festival in the comments below!